In order to reduce the risk of delay, re-routing or extensive holding, flights inbound for Alderney requiring a VFR or "Special" VFR clearance should plan entry along notified recommended routes. 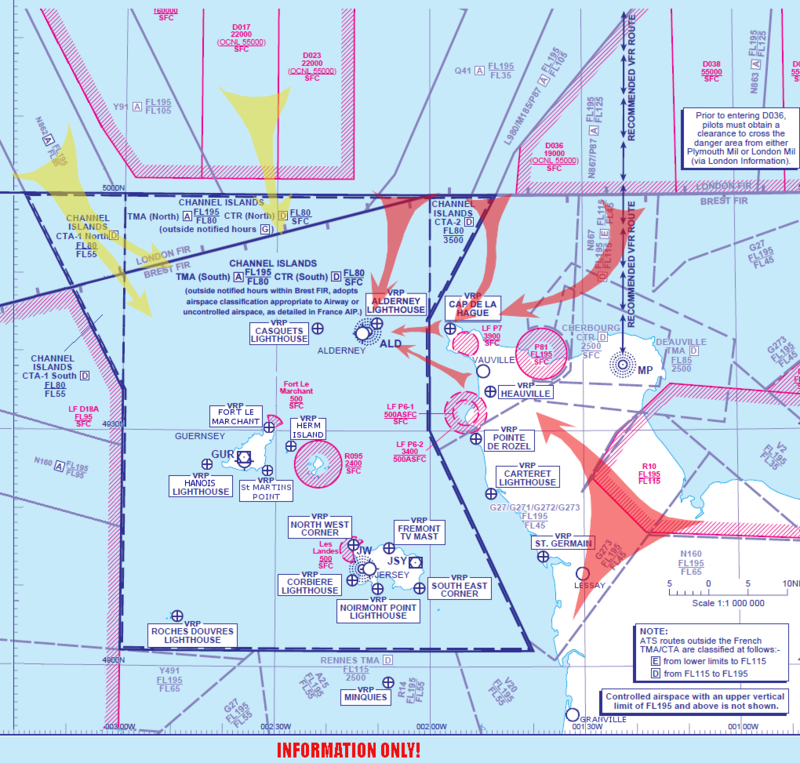 These have been established in order to keep VFR/SVFR traffic clear of any restricted areas, deconflicted from IFR Departures and Arrival tracks and to deconflict with other VFR/SVFR traffic transiting to/from the other islands. To simplify the flight planning process the abbreviations indicated in brackets () above may be used in the route field of a VFR flight plan. These entry routes are associated with defined Arrival Sectors which will be subject to a PPR Reservation based on an estimate for the zone boundary. A recommended VFR Route has been established for traffic crossing the English Channel between St. Catherine's Point and the Cherbourg Peninsular (Cherbourg NDB (MP)). In order to plan a more direct route west of Danger Area D036 it is possible to fly direct from The Needles Lighthouse on the Isle of Wight to Cap de la Hague (CDLH). Please take care to remain clear of or below the airway Q41 (Base FL35) north of ORTAC and avoid the Cap De la Hague restricted area! PPR is booked according to your estimate for the "Zone Boundary" in the appropriate inbound Arrival Sector. PLEASE NOTE: Channel Island Control Zone PPR booked through arrival sectors solely designated for other Channel Island airfields may lead to Flight Plan rejection, extensive re-routing, excessive holding or possible diversion. UK NPPL holders who do not hold a certificate of ICAO compliance to fly in French Airspace MUST contact the Jersey ATC Supervisor in order to secure an arrival clearance/route which will enable the flight to remain in UK or Channel Island Airspace. Please contact Jersey ATC Supervisor on the PPR Enquiry Line +44 1534 446309. The following Noise Abatement Procedures apply to all aircraft operating at Alderney. Please Note: This is a summary of the local noise abatement procedures and Pilots should review the textual elements of the Alderney Section of the UK AIP for comprehensive procedures. These procedures may at any time be departed from to the extent necessary for avoiding immediate danger. Every operator using the airport shall ensure that at all times aircraft are operated in a manner calculated to cause the mimimum disturbance practicable over all parts of the Island. In particular pilots will avoid overflying St Annes below 700 ft aal. Unless otherwise authorised or instructed by Air Traffic Control the above procedures shall apply to all aircraft approaching, landing, going around or taking-off in accordance with Air Traffic Control clearance and shall apply in both VMC and IMC. Site designed and hosted by C.I. Web Solutions Limited. © 2017 | Site Policy | Get Adobe (pdf) Reader for Free!